The Basic cat door is a Freedom Pet Pass door simplified down to only the essentials – the hyper-efficient DoubleMag flap system on a mountable frame. It’s perfect for special projects and advanced DIYers. The frame of all basic doors is 1/2” (12 mm) thick. Pet Opening – The smallest opening through which your cat will have to pass when using the door. This dimension is used for properly sizing the door for your cat. 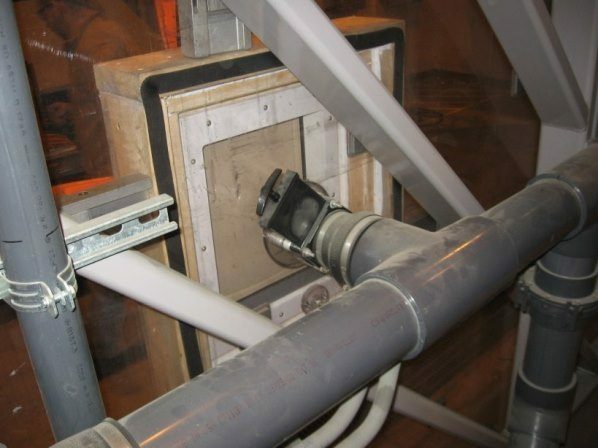 Minimum Rough Opening – The minimum size of the hole in your project needed to accommodate the Freedom Pet Pass cat door. Your opening can be up to 1” (25 mm) wider and up to 2½” (60 mm) taller than the minimum measurements. Frame Size – The overall size of the frame on the pet door; the footprint of the cat door on your project. In-stock doors ship same day* from our production facility in Bay City, MI. Your exact shipping costs and timelines can be calculated once you add your product(s) to the cart. Below is a map with estimates for UPS Ground shipping in business days. Air shipping is available for guaranteed Next Day and 2-Day deliveries. Free shipping and postal shipping may add 2-3 days to the estimates given below. Freedom Pet Pass ships around the world via both postal and UPS Air. Postal shipping takes 6-10 days to reach your country + time spent in customs + delivery in-country. During the delivery process, your country’s postal authorities will collect taxes owed in your locality. This includes VAT and GST. UPS Air will take 2-7 days to reach the delivery address, depending on country and service level selected. Customs are cleared electronically. We will collect a Tax Payment Fee to pre-pay all taxes on your behalf, including VAT and GST, so your door will arrive with no COD or any other hassle. *Orders for in-stock doors received on a regular business day with UPS Ground, 3-Day Air, 2-Day Air, and Next-Day Air shipping before 3:30 PM Eastern will ship out same-day. A “best effort” will be made to ship orders for in-stock doors received between 3:30 PM and 5:00 PM the same day. In-stock orders for delivery via US Postal Service will ship the same or next business day. In-stock orders with free shipping may be consolidated prior to shipping. Ready-to-build doors or made-to-order doors will ship the day they are assembled. Installation of a Freedom Pet Pass basic cat door can be as simple as screwing the door over the opening in your project. It can also be more difficult than that, it all depends on your project. Because basic cat doors can be used in a huge variety of different types of projects, limited instructions are provided. We recommend this door for people with substantial DIY skills or pros. Freedom Pet Pass cat doors are engineered to last for years and years with minimal maintenance and come with a 3-year limited warranty against malfunction due to manufacturing or material defects. If you’re having any problems at all with your door, don’t hesitate to contact us, whether your door is in warranty or if you’ve had it for 10+ years. We’re here to help for the lifetime of your cat door. This return policy is for doors bought from Freedom Pet Pass directly. Doors bought through distributors or retail outlets must be returned through the place of purchase. Please contact us prior to sending a return. All items must be received in like-new and resellable condition. Doors that have been installed are not eligible for return. Return shipping is customer’s responsibility. We recommend purchasing insurance and using a shipping mode that allows for tracking of packages. Once a return is received, the door will be inspected. Upon passing inspection, a return will be issued. Customized orders are not eligible for return. Returns that do not meet these criteria will be subject to restocking fees and/or rejection of the return. Shipments to Michigan will be charged 6% sales tax. We recommend buying on freedompetpass.ca for pricing in Canadian dollars appropriate tax calculations. Shipments to the UK and European countries are subject to VAT and duties, which vary by destination country. If you choose postal shipping, these taxes will be assessed during customs inspection and collected by your country’s postal authority during the delivery process. If you choose UPS air shipping, we will charge a Tax Payment Fee and pre-pay taxes on your behalf to give you a landed cost. You will not be charged anything additional during the delivery process. Shipments to Australia are subject to the country’s 10% GST. If you choose postal shipping, these taxes will be assessed during customs inspection and collected by Australia Post during the delivery process. Shipments to Australia are subject to the country’s 15% GST. If you choose postal shipping, these taxes will be assessed during customs inspection and collected by NZ Post during the delivery process. If you choose postal shipping, your country may assess taxes during customs inspection. These will typically be collected by your country’s postal authority during the delivery process. Most dog and cat doors are extremely leaky, which leads to cold, drafty rooms and high energy bills. In fact, over 90% of the energy loss from conventional pet doors comes from air leakage – letting cold air directly into your home. The Freedom Pet Pass dog door with DoubleMag seal is virtually airtight, so it keeps winter air outside where it belongs. The DoubleMag seal is so good, third-party lab testing showed that it is 15X better at preventing outside air from coming in than US Energy Star requirements for human doors. Other brands pet doors don’t actually make a seal. Even those with a “double flap” or magnets to “keep the door closed” aren’t good enough, because they don’t actually seal out the wind and drafts. Lab testing with the “best selling” pet door shows how much better Freedom Pet Pass doors perform. Under official testing conditions, the competitive door leaks over 16 cubic feet of air per minute per square foot. That’s over 500X worse than the Freedom Pet Pass standard of 0.03 cfm/sq ft! Outside temperature was -1° F (-18° C) and indoor temperature was 55° F (13° C). Oranges, yellows, and whites are areas of relatively warm temperature, while purples and blacks are areas of relatively cold temperatures. Temperature scale is on the right of the image. 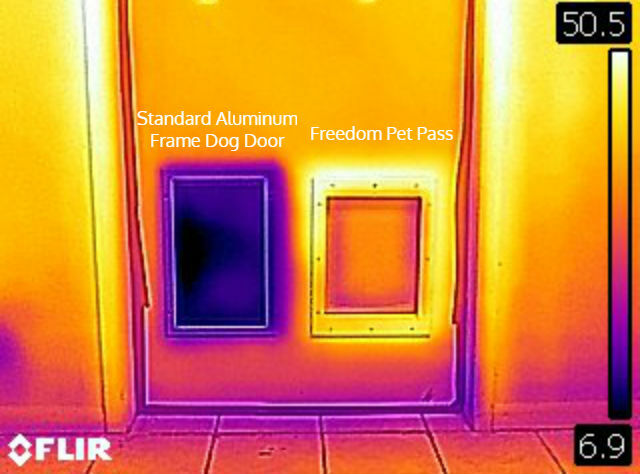 Freedom Pet Pass doors have a thick, insulated flap to reduce conductive heat loss, which is heat loss through material. Made for cold weather, the flap components will stay flexible and functional to -40 and below. The cellular PVC used in our frame is 3,000X more insulating than the aluminum material used in the frames of lesser pet doors. With pet doors, most energy loss comes from convective heat loss – cold air blowing in around a poor seal. The Freedom Pet Pass DoubleMag seal eliminates air leaks. 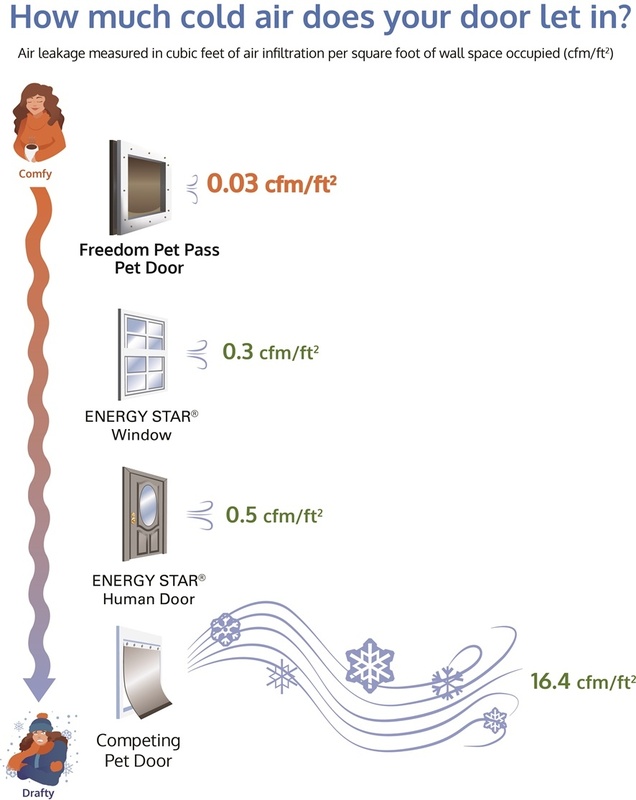 Many pet doors “claim” energy-efficiency with bogus comparisons and no proof. Freedom Pet Pass pet doors have extensive independent laboratory testing that prove how efficient they are. Our doors are evaluated using the same tests that are used for Energy Star certification for windows and human doors, and the results show that Freedom Pet Pass doors are 15X better at blocking outside air than requirements for human doors and windows. Cellular PVC Frame – Strong, weatherproof, and mold-resistant, and 3,000X more insulating than metal frames used on lower-end pet doors. Rugged Flap System – The insulated flap system is made from premium materials for maximum energy-efficiency, pet safety, and durability. The flap has an insulating SBR rubber core, protected with marine-grade canvas on each side. The flap seal is made from thermoplastic polyolefin, a material also used for industrial roofing. Can cats or small dogs use the same door as our big dog(s)? Absolutely! We have many multi-pet households where small dogs and/or cats share a door with their big brothers and sisters. When purchasing the door, you want to size and mount the door so that your biggest dog can use it properly. From there, you may need to provide some accommodation to help your smaller pets use the door (like our Pet Step). How hard is it to open the pet door? Pretty much any dog or cat has the physical capability to open a Freedom Pet Pass pet door. If your pet can push open an unlatched interior door, he or she is capable of using a Freedom Pet Pass pet door. Does the pet door keep out critters (bugs, mice, snakes, skunks, raccoons, etc.)? Yes, very well. There has never been a report of an unwanted animal entering a home through a Freedom Pet Pass pet door. How does the Freedom Pet Pass door keep critters out without a microchip system? Smaller animals, like mice, snakes, bugs, etc. do not have the physical capability to overcome the DoubleMag™ airtight seal even if they wanted to do so. Larger critters, like skunks, possum, etc. do not use the Freedom Pet Pass door because of a combination of lack of incentive and danger signals. The opaque, insulated, and airtight flap system on the Freedom Pet Pass door mean that inside light, smells and temperatures stay inside where they belong. To wild animals, the Freedom Pet Pass door is no different than any other section of wall or door. Without the draw of inside light and/or food scents, there is nothing attracting them to the pet door area. The only smell present will be that of your pets, and this is a danger signal to wild animals. With nothing enticing animals to the pet door and your pet’s odor actively discouraging them, wild animals avoid the Freedom Pet Pass pet door. We have never received a report of a wild animal using a Freedom Pet Pass door. My area gets very cold. Will the Freedom Pet Pass door freeze up? No. The Freedom Pet Pass insulated flap system remains free and flexible to -40° and below. Low-end doors often use plasticized PVC flaps that can become brittle and crack at temperatures regularly experienced in Canada. The premium SBR rubber core and marine-grade canvas used in the Freedom Pet Pass flaps do not have that issue. Can the Freedom Pet Pass basic door be installed into glass? It is certainly possible to install a basic Freedom Pet Pass cat door into glass, but there are challenges inherent with making holes in glass. We do not provide any specific guidance for this, and we recommend contracting with a professional glass contractor. Where is the Freedom Pet Pass pet door made? Freedom Pet Pass doors are manufactured in Bay City, MI using locally-sourced components and labor. Over 85% of our purchases are from vendors within 150 miles of our production facility, and over 95% of the value of our product originates from North America (US and Canada). The screws are the only components not made in the North America. The cellular PVC frame of the Freedom Pet Pass door is very paintable. While the material accepts any exterior paint, best results are achieved with vinyl-specific paints. Search “paint Azek” for tons of tips and tricks (Azek is a popular brand of cellular PVC). No part of the flap system is paintable. Do you have a warranty or money-back policy? Freedom Pet Pass offers a 30-day money-back guarantee. If you open the package and are unhappy with the product, you may return it within 30 days for a full refund. Returned products must be in salable (uninstalled) condition to qualify for a refund. Freedom Pet Pass doors have a limited 3-year warranty against failures due to manufacturing or raw material deficiencies. We stand behind our products for the long term. Even if your door is outside of warranty, don’t hesitate to write or call. We can often help fix doors without the need to buy anything. Are your doors Energy Star approved? Unfortunately, no we are not. Energy Star does not currently have standards for pet doors, so it is impossible for any pet door to be Energy Star approved at this time. That being said, we don’t think that a lack of Energy Star standards for pet doors should stop them from being energy-efficient. Our approach is to use the same tests that Energy Star requires for windows and human doors on our pet doors. We have also had our doors tested at an independent laboratory that is approved for running Energy Star testing for windows and human doors. The results of that testing have led us to be the first and only pet door to be meet pet door standards laid out under California’s stringent Title 24 building code (in fact, we exceed them by a factor of 10!). Our doors have also been included in hyper-efficient certified Passive Houses. We also think the results show that the performance of our pet doors compares very nicely with the performance of Energy Star doors and windows. Other Freedom Pet Pass doors have flap color options. Can I get a different color flap for my Basic door? Part of how we can offer Basic doors for a much lower price is by streamlining production. This means that our stock Basic doors all feature our standard dirt-hiding chocolate/tan color scheme. Depending on the season and other factors, it may be possible to get a Basic door with a custom flap for an additional fee. Please contact us to discuss. Want to see 150+ reviews, complete with photos and extended customer feedback? Check out our reviews page. Your name and email will not be published. They will only be used to ensure you get a direct answer to your question.